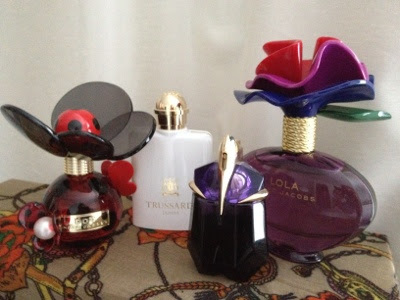 Like a lot of people, I am one fussy lady when it comes to perfumes! Over the past few years I've collected a few that I would rebuy again and again and I wanted to share these with you. Marc Jacobs Dot - this is a recent launch from Marc Jacobs. A light, fruity, floral scent, this is one of my favourite daytime perfumes. It always makes me feel really uplifted when I wear it. Trussardi Donna - Trussardi are a more unusual brand and I found this perfume on a trip to Harvey Nichols last year. It's quite a powerful scent and I often save it for the evening. It's described as an oriental floral with lots of fruity top notes, and was created to celebrate Trussardi's 100th anniversary. Thierry Mugler Alien - one of my favourites since it launched, I think this is my third bottle! Again, a perfume maybe more suited to the evening, it has fruity notes to it but with a more sensual feel. I once saw a review of this perfume that likened it to a 'whore's boudoir'. not sure what one of those smells like, but nonetheless, I love it! Marc Jacobs Lola (I like Marc Jacobs perfumes, what can I say?) - I'm onto my second bottle of this. Not only does it come in a beautiful bottle, but the smell is fab. Another fruity/floral scent, this one also features less common aromas such as pink peppercorn and tonka bean, along with the rose, fuchsia, and grapefruit. Have you tried any of these perfumes? What are your favourites? Alien is nice! My favourite is Chanel Coco Mademoiselle. Ahh Alien is my all time favorite perfume, and I love marc jacobs are always beautiful I'm currently loving Daisy, but Lola is my top marc jacobs without a doubt!